March is National Social Work Month, a special time at The Child Center of NY, where social workers play an instrumental and inspiring role in helping young people who are facing trauma, mental health challenges, and other impediments to their ability to reach their full potential in life. This year’s Social Work Month theme is Elevate Social Work, which embodies the need to recognize the extraordinary contributions of the social work profession to our society. 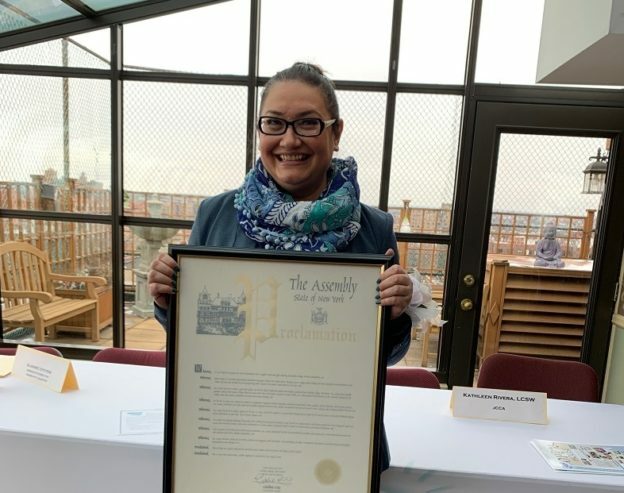 We are grateful to the Queensboro Council for Social Welfare for taking this theme to heart every year with an annual celebration honoring social workers in Queens who exemplify excellence in their profession. 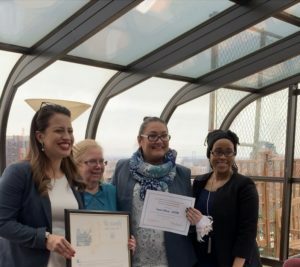 This year’s celebration, which was co-sponsored by the National Association of Social Workers, NYC Chapter and Queens Borough President Melinda Katz, was the 28th annual reception honoring the social workers of Queens. We are proud to announce that The Child Center’s own Ingrid Gomez, LCSW, Mental Health Therapist at our Early Childhood Program in Corona, was this year’s recipient of the 13th annual Fred Kuo Jr. Award, presented to a social worker who has fostered respect and understanding between peoples. We checked in with Ingrid to congratulate her on this honor, hear about the event, and learn a little more about her job as a social worker. As you’ll see in the below interview, Ingrid embodies this year’s Social Work Month theme and stands as a shining example of the important role social workers play in the lives of our youngest children. The Child Center of NY: Congratulations on earning the 13th Annual Fred Kuo, Jr. Award in honor of National Social Work Month! What was the event like? Ingrid: It was a fantastic event! I was especially honored to receive the Fred Kuo Jr. Award. Fred Kuo, Jr. passed away on 9/11 and his mother, Dr. Kuo, was the first woman to be a medical director in the Queens NYC Health Department. Speaking of city workers, what are some ways you’d like to see our public officials support social work in NYC? I think it is important for social service organizations and nonprofits to have the backing of local elected officials, especially when it comes to discretionary funds that can help fund programs in our communities, and I was deeply moved by the presence of so many elected officials at the event. 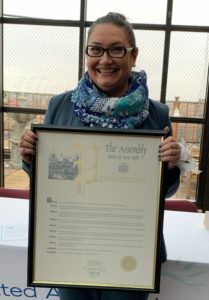 Queens Borough President Melinda Katz co-sponsored the event and there were several elected officials in attendance, including my Assemblywoman, Catalina Cruz, who surprised me when she presented me with a proclamation from the New York State Assembly. Council Members Donovan Richards and Peter Koo were also present, as well as Assemblyman David Weprin. What made you pursue a career in social work? I think it was in the stars! Coming from a long line of helpers — including my mother, who was a teacher in Colombia and now works as an activity therapist with psychiatric patients in a city hospital — I felt compelled to follow a career in social work and public service. I also benefited myself from people who chose to be “helpers.” On May 17, 1991, my father was murdered, a victim of gun violence at the height of the drug war in Colombia. Almost a decade earlier, my divorced mother of three had brought her young family from Colombia to the U.S. I went from living in Colombia to living with middle class relatives in Miami to the South Bronx, where we eventually settled in 1985. Crime was at an all-time high, drugs were rampant, and burnt-down tenement buildings had been turned into crack houses. Our mother struggled to make a living, working as a housekeeper in a factory, while my brothers and I attended the worst-performing schools in the poorest school district in the city. Ironically, the poverty we were trying to escape in Colombia had become our reality in the United States. But even though I went to tough and under-performing schools and my academic future seemed uncertain, there were several dedicated teachers who saw my potential and encouraged me to excel. These teachers helped me to get into a good public high school, where I had the support of a wonderful social worker who was tremendously helpful when I lost my father. I think it was these life challenges that shaped me and inspired me to become a social worker with working-class immigrant families and children. How did you end up at The Child Center of NY? For a very long time, I wanted to work at The Child Center of NY because of its excellent reputation in serving low-income/working-class families of Queens. I started working at the Early Childhood Program in Corona in March 2014, so I just celebrated my five-year work anniversary! I am also one of the few fortunate ones to work in the community I live in, so that is certainly a huge plus. Living and working in Corona helps me to understand the challenges my clients encounter when it comes to housing, work, and quality of life. What’s it like working with such young children as a social worker? I love working with 3- and 4-year-olds and their families! They are full of so much joy and love! I feel like a celebrity each time I pick up a child from the classroom or when I’m walking past them in the hallway. They yell out, “Ms. Ingrid! Ms. Ingrid!” when they see me. It’s awfully cute and heartwarming! Being a social worker for young children has been a deeply rewarding experience and at the same time it has been very challenging, especially when dealing with clients with histories of abuse and trauma. It’s very hard to hear stories of sexual and physical abuse and domestic violence almost every day, and I have to admit that sometimes it can be very overwhelming and can cause secondary trauma. That’s where supervision and self-care is super important. I have a wonderful and supportive supervisor, Beverly Gould, LCSW, Psy. D., who provides the space for me to process my most difficult cases and helps me with interventions to help these clients. I also knit, which is very therapeutic, I lead a life of prayer and meditation, attend church regularly, and spend time with friends. Are you glad you decided to pursue a career in social work? Yes. I wouldn’t have it any other way. This was obviously a very meaningful honor that you received. What are some other recognitions you’ve received that have been meaningful? Not necessarily an award, but when you’ve been recognized in some way for your efforts. I had a case of a mother with three boys, and the younger boy was a student at our center. The mother had just left an extremely abusive relationship in which she had been controlled, isolated, beaten, and stalked by a former partner, and the children had been witnesses to this violence. The older boy was dealing with coming out, the younger child was acting out in school, and they were all processing the violence they had experienced. We discussed these issues in family therapy, and the mother and the older son also had dyadic sessions in which the son came out and the mother affirmed her love and acceptance of her son as a gay young man. The mother also participated in a group for DV survivors, and she later became a peer advocate for other women going through domestic violence. The mother of this family was extremely gracious and thanked me for helping her and her children through the aftermath of the abuse as they worked on healing and picking up the pieces of their lives. That was one of my most successful cases, and I’m very proud to have helped this family. Throughout my long social work career there have been many instances when a client or family has told me of the deep impact I have made in their lives, how they have healed or how they feel more connected to others as a result of our work together. There really is no higher honor than to have made a positive difference in someone’s life.